Buena Vista Social Club’s “Candela” — a traditional salsa track — played in the background and filled the otherwise modern, casual ambience of Papi’s Cuban and Caribbean Grill, the newest Emory Point restaurant. The chain, which provides affordable and savory meals, also has locations in Midtown, Kennesaw, Lawrenceville, Tucker and the Hartsfield–Jackson Atlanta International Airport. Papi’s prides itself on its authentic Cuban sandwiches and entrees, ranging from sliced ham and roast pork on soft Cuban bread to ropa vieja beef over beans and rice. The establishment offers a few vegetarian options as well. Their tostones (savory plantains) and maduros (sweet plantains) are a good option for non-meat eaters, Netra Anand (19C) said. The Thursday I walked through the doors, I happened upon Ladies’ Night’s — $5 mojitos and goodie bags strewn all over the restaurant. As the waitress walked my friend and me to our table, I took in the rust-red and maize-yellow walls. Hispanic paintings hung every few feet — a close-up of someone’s face, or a narrow street corner of Havana — creating the sense that we were immersed in Cuban culture. Our waitress brought out our appetizer, the empanada sampler. 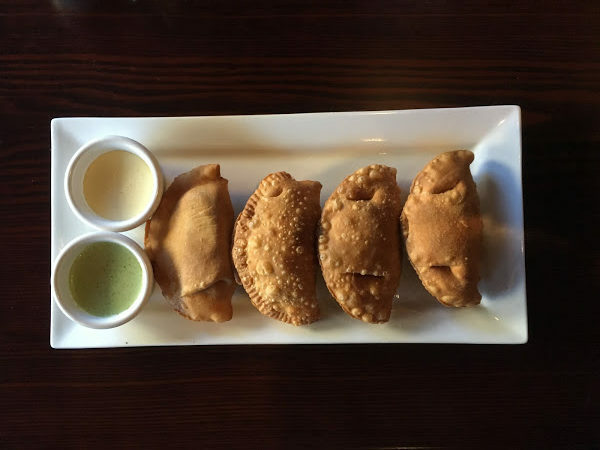 For $8 ($5 on Ladies’ Night), a quartet of chicken and beef empanadas were delivered neatly lined up, with salsa verde and garlic mayonnaise dipping sauces. The empanadas were piping hot and fried to irresistibly indulgent perfection. I savored the crumbly and crisp texture of the outer crust, as well as a softer interior pastry. The fried crust complemented the ground beef filling, with the onions’ and bell peppers’ spices balancing out the salted flavor of the beef. The beef itself melts in your mouth, leaving a lingering flavor and a craving for more. To top it off, I dipped the beef empanada in the salsa verde, giving the fried treat a spicy kick without masking the taste of the beef. The chicken empanadas were juicier, but had a milder flavor. The crust was similarly crispy and soft, and the chicken was shredded, leaving a tender taste in my mouth. These chicken empanadas pair well with the garlic mayonnaise dipping sauce, which enhances their relatively mild flavor. For my entree, I ordered the Papi’s Sandwich: a roast pork and ham sandwich paired with mustard, Swiss cheese, and pickles. All of their sandwiches are served on Cuban bread — a slightly sweet bun. I ordered mine with lettuce and tomato. The dish finally arrived loaded with a generous portion of fries. When I picked up the sandwich, I was disappointed that it was lukewarm. But as soon as I took a bite, I could only focus on the flavor. The Cuban bread was incredibly flaky on the outside and airy on the inside. Its slightly sweet tinge complemented the savory mix of pork and ham. The roast pork itself was well-shredded and tender, and the mustard added a slightly tart flavor to the overall sandwich. The sandwich itself, however, did not seem like anything special, with the exception of the Cuban bread. Additionally, my sandwich did not come with lettuce or tomatoes, as I’d requested. The fries were not satisfactory either. They were also lukewarm and not cooked all the way. Though crisp on the outside, the fries were relatively flavorless. In the future, I would substitute another side, such as rice and beans. My friend ordered the maduros and the tostones with a cup of black bean soup. We did not order dessert, but Papi’s offers a few cheesecakes (guava cheesecake, anyone? ), as well as flan and a Tres Leches Cake. The restaurant also offers coffee and smoothies. Overall, dining at Papi’s was a positive experience. I definitely recommend the empanada sampler (4.5/5 stars) and a rice plate entree over the the sandwich (3/5 stars), but would skip the fries. The service could be more efficient, especially since there weren’t many tables being served, but the food makes up for it. With a fresh selection of authentic Cuban food, Papi’s is a novel and affordable culinary experience that should be on every Emory foodie’s list.